Composite: North America, West India Islands. Composite: A Map of the British Empire in America. North America / performed under the patronage of Louis Duke of Orleans, First Prince of the Blood by the Sieur d'Anville ; greatly improved by Mr. Bolton ; engrav,d by R. W. Seale ; Gravelot, delin. ; Walker, sculp. A Correct Map of the United States. 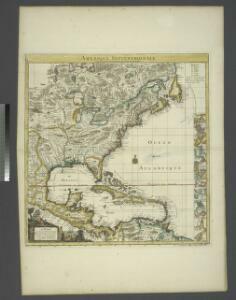 The United States of North America : with the British territories and those of Spain, according to the treaty of 1784 / engrav'd by Wm. Faden.